A couple of days back, we got our first official press renders of the upcoming Blackberry Key2, thanks to none other than Evan Blass. The renders revealed a pretty familiar design as compared to last year’s KeyOne along with some major design changes like a dual rear camera setup, a fully textured rear panel, a refined QWERTY keyboard and more. Till now, we have only heard rumours about the specifications of the Key2. 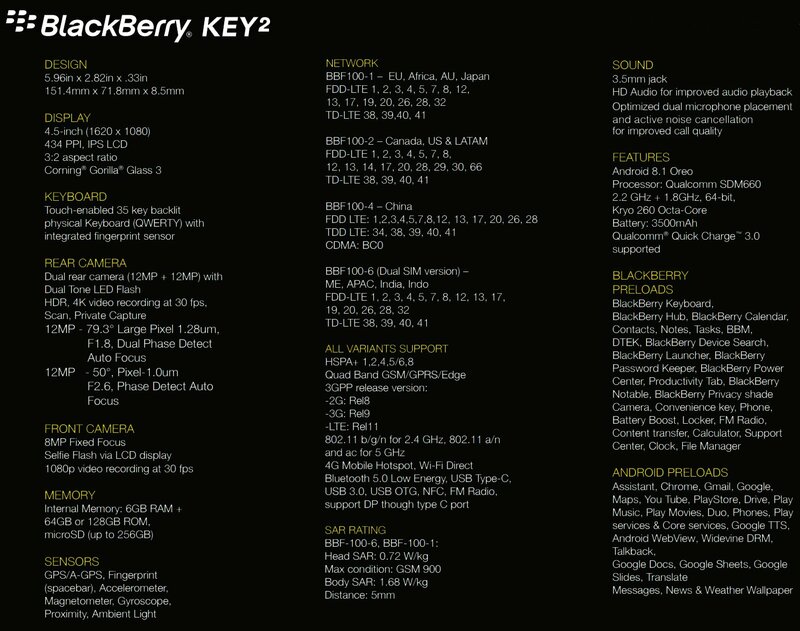 But today, Evan Blass revealed the full spec sheet of the phone which leaves nothing to the imagination. The Blackberry Key2 has a 4.5-inch IPS LCD Full-HD display with a resolution of 1620×1080 pixels, 434ppi pixel density, 3:2 aspect ratio, and Corning Gorilla Glass 3 protection on top. Powering this device, there is an octa-core 2.2GHz Qualcomm Snapdragon 660 processor along with 6GB RAM and 64/128GB internal storage. The storage is expandable up to 256GB via microSD card. The battery under the hood is a 3,500mAh unit which is enough to last a full day of normal use. The phone also supports fast charging via Qualcomm Quick Charge 3.0. On the rear, the Blackberry Key2 has a dual camera setup that includes a primary 12MP camera with f/1.8 aperture, Dual Phase Detect AF and a pixel size of 1.28 micron. The secondary rear camera is also a 12MP unit, but this one has f/2.6 aperture along with Phase Detect AF. On the front, there is an 8MP camera with Fixed focus and Selfie Flash via LCD. The rear camera can shoot 4K videos at 30fps while the front camera can shoot up to 1080p videos at 30fps. There is no mention of OIS on the rear camera, so that’s a disappointment. As shown in the image above, there are a ton of preloaded apps from Blackberry. The phone doesn’t skip on sensors and has almost all of them. All the ports are there, including the 3.5mm headphone jack and the USB type-C Port. Just like last year, the fingerprint scanner is embedded underneath the space bar on the QWERTY keyboard. 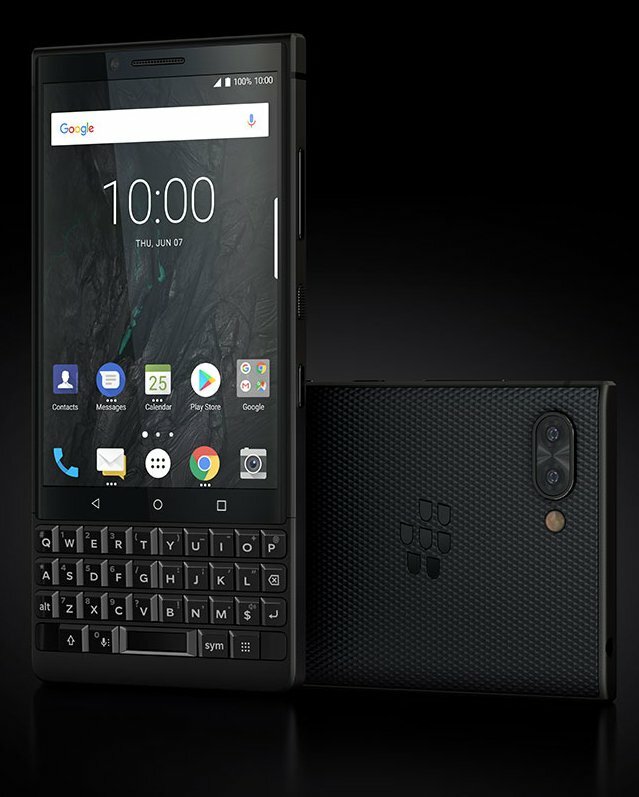 Still, we are not sure what that extra key on the keyboard, which Blackberry showed in the official teaser, is meant for. Finally, coming to the pricing, Evan Blass revealed that the Blackberry Key2 is going to be priced at $649 US / €649 EU / £579 GB / $829 CA. Now, we are not sure if this pricing is for the 64GB variant or the 128GB variant. But, one thing that can be concluded from this pricing is that Blackberry Key2 is going to be an overpriced device from the company, just like the previous Blackberry phones. The launch is set to happen on June 7 so let’s see what Blackberry has to offer with its new device.